She says the fact that the family court in London made findings and ruled that Nadeem Kiyani should not come near or enter into the family home unless agreed with the court in advance is a proof that Dr Nadeem Kiyani posed threat to both Zeeshan and their two sons. Zeeshan Zia and Nadeem Kiyani’s sons Faizan Kiyani, 17, and Mukarram Kiyani, 16, live in the house which was subject to arson attack. At the time of their marriage, Nadeem Kiyani was working as a deputy director in the Export Promotion Bureau of Pakistan while Zeeshan Zia was running her own schools. A doctor by profession, Kiani never practiced as a doctor but passed the CSS examination to become a bureaucrat of 23rd Common. After two years of marriage, he resigned and joined his ex-wife’s schools in Accounts & Administration. This was Kiyani’s second marriage while he has a son and two daughters from his first marriage, named Aurangzeb Nadeem Kiyani, aged 28, Minahil Kiyani, aged 26 and Mishail Kiyani aged 22. Zeeshan Raja says that the FIA arrested Dr Nadeem Kiyani on the 5th October, 2018 and all the relevant material, including mobile, laptop etc, were seized on the same day but were handed back to the accused at the time of his release. She says that had to plead before the FIA that the law was violated in the release of Nadeem Kiyani and only after a lot of protest--and complaints lodged with the Additional Director FIA, Islamabad, Capt Shoaib --that Dr Nadeem Kiyani was again arrested on the 13th October, 2018 and has been in Lahore Camp Jail since then. On Friday, Additional Session Judge, Lahore, Ali Raza, rejected post-arrest bail application of Nadeem Kiyani and noted that the FIA investigation had gathered "incriminating evidence" which prima facie connects Nadeem Kiyani with the alleged crimes. The judge writes: "The allegation of uploading sexually explicit image/photograph of the complainant is more than the shame and shock which one might feel when one discovers herself to be the victim of this crime." His son Aurangzeb Nadeem Kiyani was on protective bail until the 2nd November, 2018. The Judge Ali Raza accepted his pre-arrest bail subject to "execution of fresh bail bonds in the sum of Rs 2,00,000". 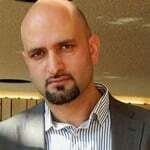 A family court in East London in a ruling on 1st August, 2017, ordered that Dr Nadeem Kiyani shall “not return to, enter or attempt to enter it save for the purpose of spending such time with the children of the parties as may be agreed between the parties in writing or as ordered by the court”. Zeeshan Raja’s lawyer Barrister Waheed Rehman confirmed that he will be taking up the findings of FIA, Pakistan, with the cybercrime agencies in Britain. He said that it has been proven that Nadeem Kiyani and his son Aurangzeb Nadeem Kiyani committed cybercrimes in UK as well through hacking of emails, Facebook, Natwest bank account, misusing Natwest card of Zeeshan Raja to buy unauthorised things from Amazon. In addition he has been continuously harassing her kids and her team in UK who are taking care of her kids in her absence. Zeeshan Zia and Nadeem Kiyani reached to the UK in 2014 on Tier 1 visa and set up a child care nursery which is no more operational. There are over 50 cases in different courts in Pakistan, including the Civil Court, Session Court, High Court, Banking Court and FIA.